For years, I have recommended my easy recipe for Cider Baked Turkey Breast, but had never converted the recipe to a whole turkey. Being stuck with two eighteen pound turkeys that did not get cooked for Thanksgiving, I realized that today was the day to give it a try. The results for the whole baked turkey were the same delicious old time harvest flavor that I have received with just a turkey breast. I am giving you the directions that I have used for turkey breast. I improvised for the whole baked turkey with the same ingredients. Place turkey breast, skin side up, in a large roasting pan. 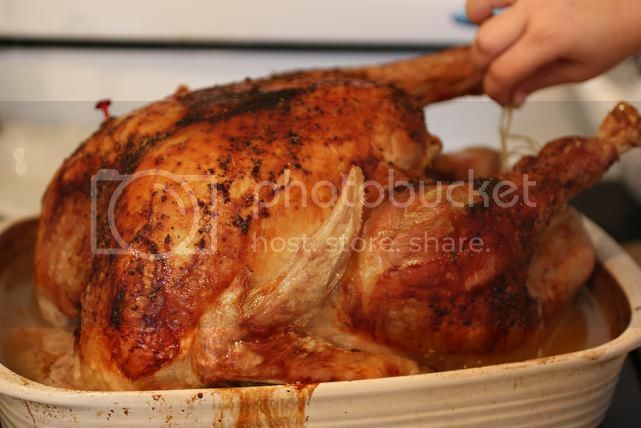 Remove turkey from oven and lower temperature to 325 degrees. In a large bowl, combine the 1 1/2 cups apple cider and the soy sauce; pour mixture over turkey breast. Cover and bake for 1 1/2 to 2 hours more, basting turkey frequently with cider mixture. In a small bowl, combine cornstarch and remaining 1/2 cup apple cider. Remove turkey from oven and bake, uncovered, until sauces is thickened, about 15 to 20 minutes more. Transfer turkey to serving platter and serve with the sauce. 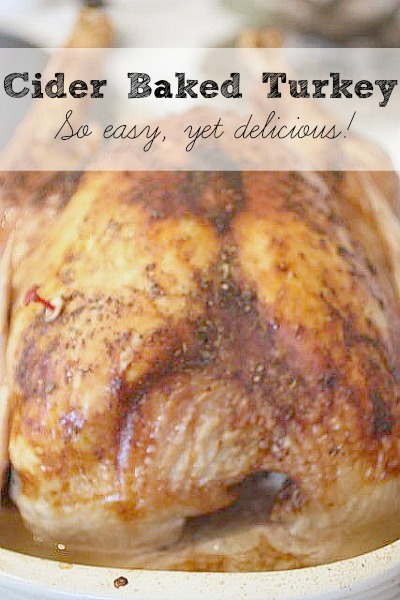 This is the easiest turkey recipe EVER. If you’ve never cooked a turkey or are a master in the kitchen, it’s a tried and true recipe meant for sheer taste. Additional info. I am a busy mom who has never basted the turkey the entire time. In a perfect world, this would be ideal. I have intentions of basting it frequently, but always forget. It’s still tasty. I have also substituted some orange juice when I ran out of apple juice for a wonderful flavor as well.